The mining history of Idaho is varied, complex and rich in detail and personal stories. And much of that history is centered in the area known as the Boise Basin. 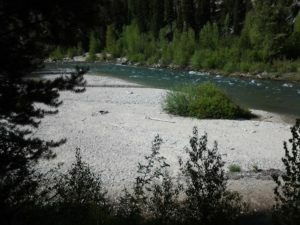 Idaho Gold Mining presents a general history of the area but there are countless book and articles written on the area that explore it’s history in depth. We suggest reading Basin of Gold by Arthur A. Hart for a comprehensive view of the lives of people that settled in the Boise Basin and checking out Boise County’s mini-history at http://www.boisecounty.us/Visit_Boise_County.aspx. 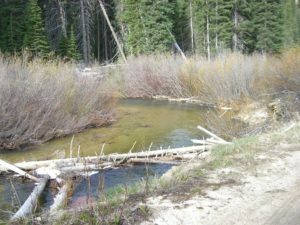 Placer deposits of gold were discovered about 25 miles northeast of Boise in 1862 and soon additional deposits, including significant numbers of lodes, were found covering the mountainous land. Boise Basin was divided into several mining districts and it covered an area of 300 square miles. Some of the most notable districts were Idaho City, Moore Creek, Centerville, Quartzburg, Pioneerville and Grimes Pass. All these districts and deposits yielded over 2,800,000 ounces of gold between the years of 1863 and 1959! The placer deposits were worked first by dredges and then by large hydraulic washers. Sometimes entire hillsides were washed away. Individual miners resorted to panning with pans that resembled bread pans made of iron or tin. If they were lucky they also had the use of rockers and sluice boxes. Lode work was more erratic and less dependable; miners would work lodes for a few years until another fresh deposit was discovered in a different mining district within the Boise Basin and they would pull up stakes and move on. Mill sites worked in a similar way. Whole operations would be dismantled and reassembled again and again around the Boise Basin. The Quartzburg Mining District was notable for its lode deposits. It’s still active today with the large and profitable Cumo Mining Project working the area northwest of Idaho City. Several camps and towns were formed from the huge gold rush that took place when gold was found in the Boise Basin in the 1860s. 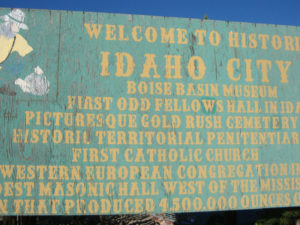 Thanks to the largest gold rush in American history during the Civil War, Idaho City was founded and flourished. By 1863, it claimed over 6,000 residents, making it the largest city in the Northwest at the time. Other business were set up to serve the miners, but mining was the goal of the entire settlement. Mining was actually done in the boundaries of Idaho City. Houses collapsed because the foundations were mined out from underneath them! Though it burned a few times during it’s lively past, many of the historic buildings still stand today and can be visited by tourists and modern-day gold miners alike. 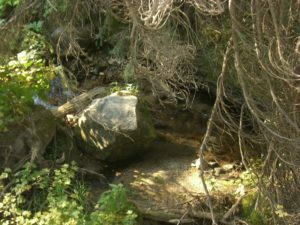 Gold Miners from all walks of life came to the region seeking out their fortunes and their own mining claims in Idaho. Americans from the East and Chinese worked the lands and those that couldn’t hack it as gold miners took up work as merchants and farmers. And their work paid off. The Boise Basin was the richest gold strike ever seen in America. More gold was taken out of the land during this rush than the California 49er or the Klondike gold rush. Some say that even though the Boise Basin was worked intensively for decades, only a fraction of the gold in the mountains was discovered and pulled from the ground. Why couldn’t there be more deposits just waiting to be tapped? 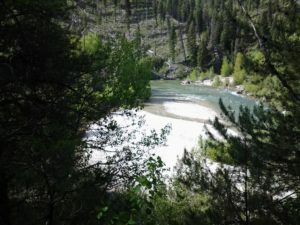 Check out listings for Clear Creek, Grimes Creek, Crooked River and the Middle Fork of the Payette River for historic gold claims in Idaho’s famous Boise Basin.